Lets explore the benefits of drinking distilled water together; there is a lot of confusion and misinformation about distilled water. Why the Body Cries Out for Water. Not all Water is Good for the Body. 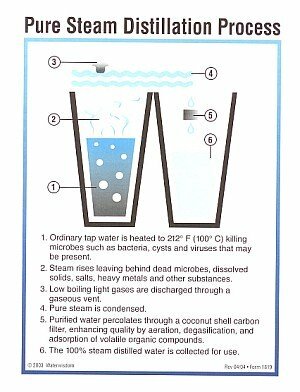 Myths and Misconceptions about Distilled Water. Benefits of drinking distilled water, what is distilled water? it is water in its purest form, it contains nothing. As the sun heats the oceans and the steam rises to form clouds all the salt and impurities are left behind. As more and more steam evaporates into clouds they become heavy and it starts to rain, this rain is distilled water. Unfortunately with all the pollution in the air today the rain that falls is not so pure and is loaded with toxins. A steam-distilled water machine works the same way as nature. You add water to a boiler place it in the machine and as the water boils killing all bacteria and parasites the steam rises leaving behind all impurities. Your body comprises 60-70% water and you lose water through perspiration and going to the bathroom. For a healthy balanced body this water must be replaced. Consider the digestive system it requires a lot of water to just digest food, everyone knows the discomforts of a digestive system that is not working correctly. The American Journal of Epidemiology, on May 1, 2002 published a study that was conducted over a 6-year period of 20,000 men and woman, age’s from 38 to 100. The woman who drank 5 glasses or more a day were 41% less likely to die from heart attack than those who drank less than 2 glasses. Not surprising considering the heart is 79% water. You may be thinking why not buy bottled water or filter tap water? Bottled water is an unregulated industry and there are a lot of unknown facts about what is in bottled water. Also what about all that plastic waste? very little is recycled and it stays in the environment for many years. Filtering tap water does not remove all impurities and there is the added expense of replacing filters not to mention another chore to do on schedule otherwise the filter is ineffective. Chlorine is another hazard it is added to kill bacteria and parasites and living organisms, your body is a living organism, what do you think it is doing to your body? Research being done today is linking chlorine to many ailments in the body. 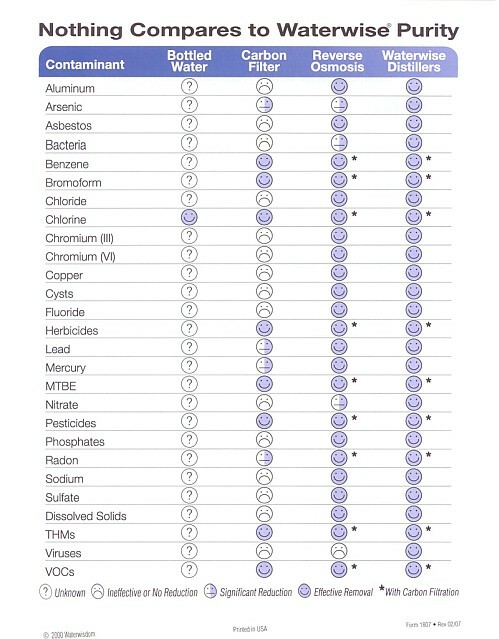 Tap water and bottled water (most of which is tap water) still contain minerals either natural or added. Because these minerals are inorganic the body cannot assimilate them over years they build up in the joints causing arthritis and playing havoc with your inner organs. People claim that distilled water leaches vital minerals and nutrients from their bodies, minerals and nutrients that are vital for their health. The truth is that any organic mineral you eat or drink are immediately broken down and used by the cells of your body. It is not possible for distilled water to remove those minerals from the cells as they are well on their way to building more healthy cells. However inorganic minerals you eat and drink cannot be broken down and used by the cells of your body. The best way to get organic minerals into your body and cells is to juice fruits and vegetables, they contain all the minerals, nutrients and trace elements the body needs. Benefits of drinking distilled water will hydrate and replenish the body that is 60-70% water. 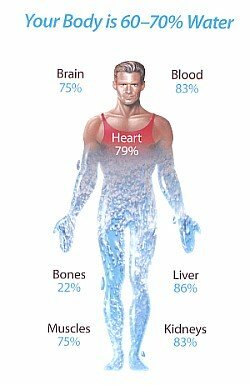 As distilled water travels through your body it absorbs inorganic minerals that have built up in the joints and organs over the years, flushing them out of your body. Your body will feel lighter, healthier and have a lot more energy. The people that claim distilled water leaches minerals from their bodies are both right and wrong. Right, it will leach harmful inorganic minerals and toxins from their bodies. Wrong, distilled water will not leach vital minerals and nutrients from their bodies. No Installation Just Plug it in. Reduce Stress Anxiety and Depression. Relieve Headaches and Dizzy spells. Alleviates Asthma, Allergy and Arthritis Symptoms. Remove Toxins and Waste Products. Transport and Increase Nutrient Absorption. Cost of Machine but less than Reverse Osmosis System and all its Filters. Charcoal Filter to Replace every 2 months less than $50.00 per year and easier than unscrewing a bottle cap. Your Time to start machine to make Distilled Water less than 10 minutes. Higher Volume Automatic Machines are Comparable in Price to Reverse Osmosis systems.